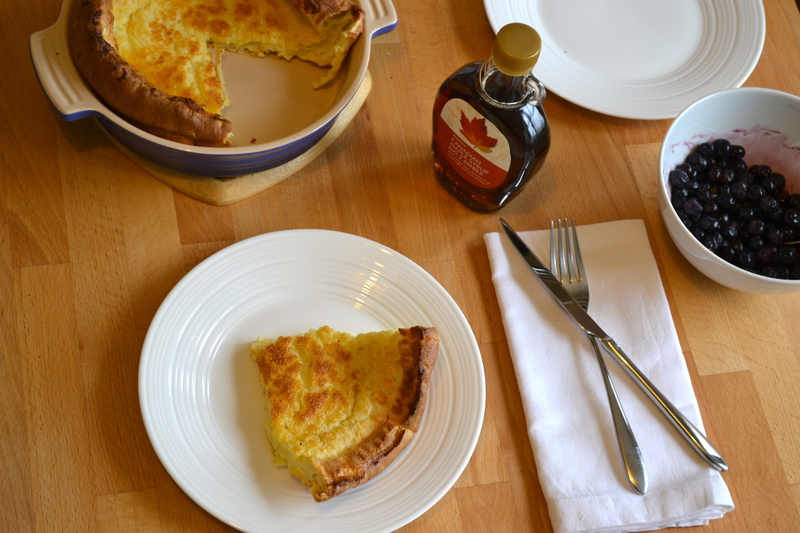 When a friend from the US emailed a couple of weeks ago asking whether I had ever made a recipe called “Dutch Babies”, I was completely intrigued. What a name for a recipe! 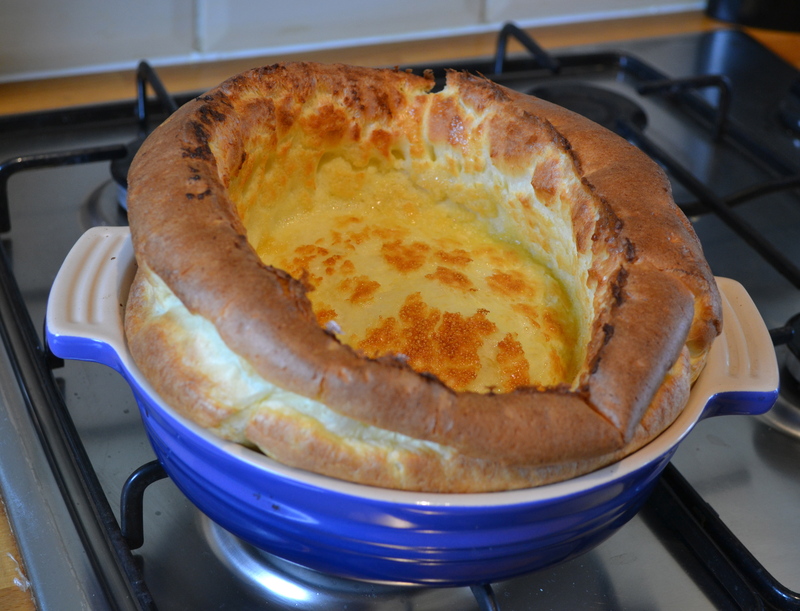 I was then completely sold as she continued to describe it as a raised oven-baked eggy pancake, which rises up like a popover (another new word for me – aka Yorkshire puddings for my fellow Brits) whilst in the oven. As my regular readers will know (and even newbies can probably guess from my blog’s name), I LOVE a good pancake. Whether in slim-line form dusted with sugar and a splash of lemon juice, or a fluffy stack of pancakes slathered in maple syrup and scattered with berries/bacon and banana, pancakes are pretty much my perfect breakfast. So the idea of a giant, bake-in-the-oven, fluffy pancake sounded like breakfast nirvana. According to the font of knowledge that is Wikipedia, the name “Dutch Baby (pancake)” apparently refers to the group of German-American immigrants known as the Pennsylvania Dutch, where “Dutch” is a corruption of the German “Deutsch”. You can make this recipe into lots of little pancakes using a Yorkshire pudding tray but my greedy side likes the idea of one giant pancake instead. It’s both easier to make and more impressive as it comes out of the oven. Just like a yorkshire pudding or a souffle, it does sink after a couple of minutes out of the oven, so you’ll need to tuck in quickly! The recipe I’ve used is based on Joy the Baker‘s. 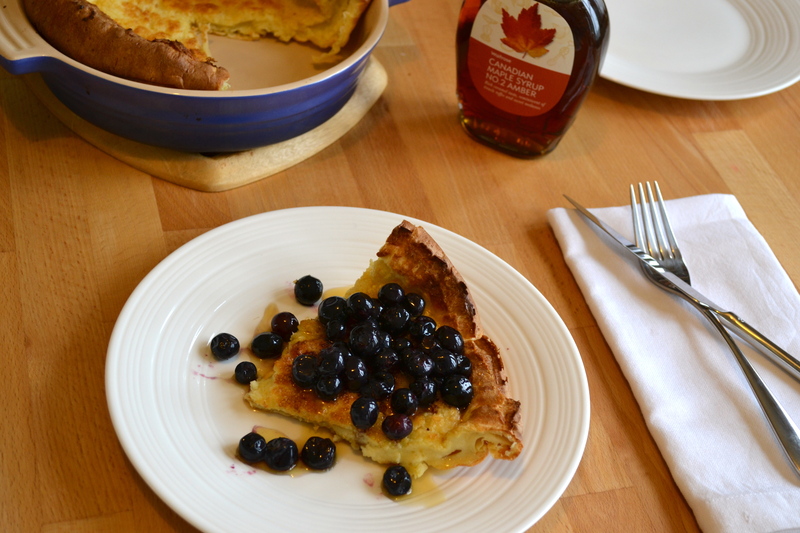 She serves her Dutch Baby with orange sugar, which does sound delicious but I’m a sucker for maple syrup so that’s what graced the top of mine, together with some blueberries. I did include some orange zest in the batter instead though for an orangey kick. The result was a delicious cross between a pancake, eggy bread and a sweet Yorkshire pudding. 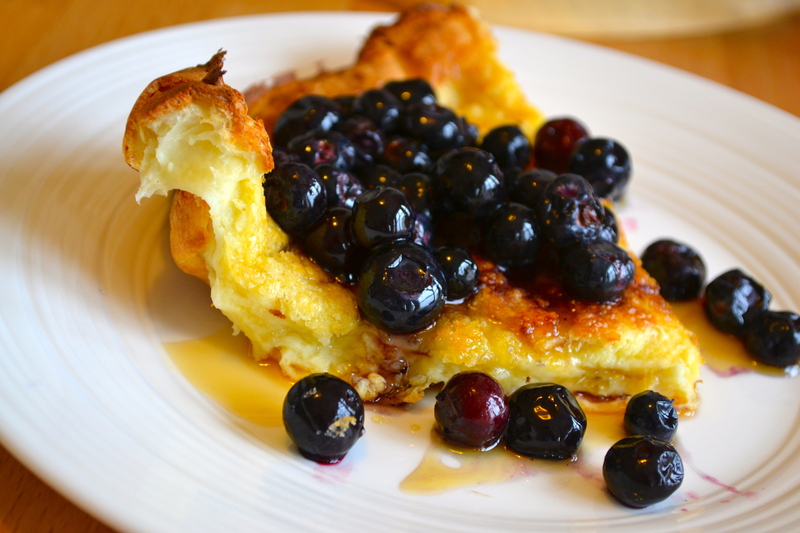 The sides were crispy and the bottom spongy; the perfect vehicle to soak up the juices from the berries and syrup. All in all an extremely good way to kick of the weekend! 1. Pre-heat the oven to 220°c/200°c fan/425°f. 2. Put the butter in a 10 inch/25cm-ish skillet or any other ovenproof dish (I used a 23cm ceramic dish) and place it in the oven to heat up. 3. 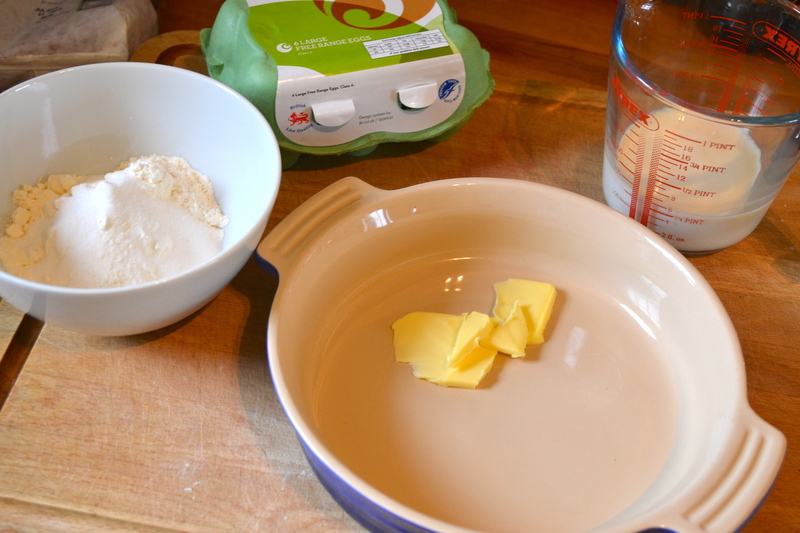 Meanwhile mix together all of the other ingredients using a whisk until you have a thin, smooth batter. 4. Once the dish and butter are seriously hot (mine took about 7 minutes to get there), carefully pour in your batter. Return to the oven to bake for 20 minutes until your Dutch Baby is puffed up, golden and cooked through. 5. Serve immediately with a selection of the above toppings. P.S. You could swap the orange zest for some cinnamon in the batter, perhaps served with stewed apples for a delicious alternative. Or just keep the batter plain and serve with maple syrup and bacon.